Sound Masking and Management by Smart Space Solutions, Inc.
Sound masking is the addition of sound created by special digital generators and distributed by normally unseen speakers through an area to reduce distractions or provide confidentiality where needed. Often referred to erroneously as white noise, the sound spectrum and level is specially shaped to provide the degree of privacy desired by occupants. Smart Space Solutions designs and installs sound masking systems in homes, commercial offices, medical facilities, hospitality areas, houses of worship, labs, libraries, court rooms, and in secure facilities to provide secrecy. It also can be used outdoors to restore a more natural ambient environment. Cambridge Sound Management systems provide precise control over where the masking sound is emitted. This means that sound masking is dispersed only in the spaces in which it is needed, eliminating unwanted spill over into adjacent spaces. 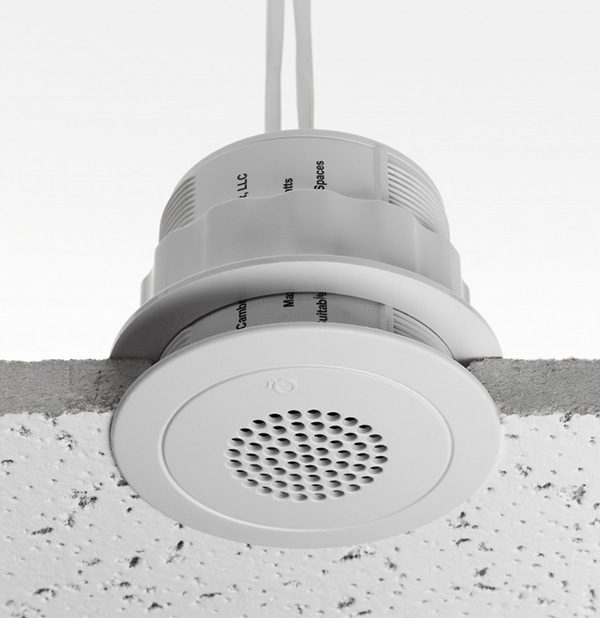 The system provides a uniform blanket of sound coverage throughout the work space and is unaffected by ceiling design and the many obstructions that often litter the plenum. The sound is transmitted as four uncorrelated channels, creating a more pleasant and comfortable masking sound. Emitters can be installed into any work space, no matter what type of ceiling is present. The system is designed to grow and change with your business. Qt emitters can be moved and reconfigured with minimal effort and impact when your work space changes. Emitters are installed along a simple grid pattern with space determined by ceiling height. In new construction or in existing space, emitters can be installed rapidly and with low impact to the surroundings and little to no down-time for the business. The system is designed to grow and change with your business. Qt emitters can be moved and reconfigured with minimal effort and impact when your work space needs to change. Systems integrate paging and music functionality, making this 3-in-1 system a complete solution for creating better acoustic environments. Quiet Technology is the most environmentally friendly sound masking system on the market. All systems are GreenSpec listed for their energy efficiency. Qt can also contribute to your facility’s LEED certification by improving your acoustic environment and can mitigate the acoustic challenges created by some LEED requirements. Each Qt® system comes pre-tuned with our masking spectrum, specifically calibrated to efficiently mask the frequencies most commonly associated with the human voice.